Arguably one of the most anticipated superhero films ever made, Captain America: Civil War hit screens at midnight last night to high expectations. most fans would have even thought, and then some. superhero trilogies ever with the Captain America series. War comic book series in 2006.
really talking about their business and future. morals and tests the Avengers loyalty to the hilt. been with them for so long. hurt by the Avengers, sending him off on this destructive path. it’s clearly painful for him to see his new family of the Avengers be torn apart. constructing such a tight knit and tense film with all the characters they had to squeeze in. this film contains the best action from any superhero film to date. to shine and show why they were in this battle. was portrayed expertly across the length of the film. more fascinating to watch them battle each other. brilliantly and making explosive entrances. to the bewilderment of Team Cap. He was written exactly like he is in the comics, with humour at all the wrong times with a deeply personal motive to set him up for his fight. This was something that severely lacked in previous Spider-Man films. Tom Holland’s chemistry with his co-stars was also a joy to behold and will have fans pining for more. 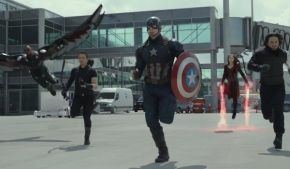 Captain America: Civil War works so well because Marvel have built this cinematic universe piece by piece, never missing a detail, always one step ahead of its audience, reeling us in to love these characters as much as we love them on paper. It tugs at your belief in your favourite character, or who you think is right and who you want to win. It all matters so much because we’ve been on this journey with them, instead of making them battle in the first film in which they all meet. This is the genius of what Marvel has achieved and is still trying to achieve. They make great comic book films but just like the comic books themselves, they create stories and characters that fans care about and will cherish forever. The rest of Phase Three for Marvel looks slightly different than anything we’ve seen before but one that fans are looking forward to with as much enthusiasm as ever, and who can blame them after such an explosive start as Civil War.